One of Oman’s gifted photographers, Bin Ali, published an editorial featuring elegantly detailed pieces from Meera Al Hamadani’s AW18 collection, photographed at the Kempinski Hotel in Al Mouj, Muscat. Next article Where To Shop For Oman’s National Day? 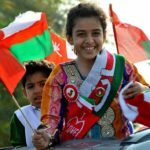 Where To Shop For Oman’s National Day?